There ain’t no party like a Catholic party. It’s true. What kind of people take part in this awesome Catholic party? I am so glad I asked! The Communion of Saints are the ones who make up this unending party! Let’s chat about this Communion of the Saint variety! 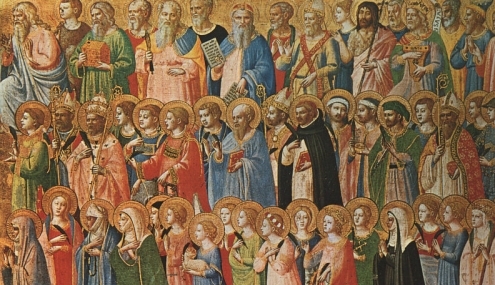 The Communion of Saints comprises the three parts of the Church: the Church Militant (the baptized faithful on Earth), the Church Suffering (the faithful, suffering in Purgatory), and the Church Triumphant (the Saints in Heaven). Communion is defined as “the act of sharing, or holding in common.” What is it that the Communion of Saints holds in common? They got the spiritual goods, man! No, seriously, we share spiritual goods. “Since all the faithful form one body, the good of each is communicated to the others. . . . We must therefore believe that there exists a communion of goods in the Church. But the most important member is Christ, since he is the head. . . . Therefore, the riches of Christ are communicated to all the members, through the sacraments. As this Church is governed by one and the same Spirit, all the goods she has received necessarily become a common fund”(CCC 947). The Communion in the Faith – we share one common Faith together, which has been given to us by Christ and handed to us from the Apostles and their successors in union with them. The Communion of the Sacraments – The Church, guided by the Holy Spirit imparts grace to us in the Sacraments. In all of the Sacraments we are united to Christ and to our brothers and sisters in the Faith. The Eucharist, above all else, is the Sacrament where this union is brought to its apex. The Communion of the charisms – The Holy Spirit imparts upon the faithful particular yet different gifts to be used for the common good and for the Church. Communion in Charity – Being united to Christ, the Head of the Body of Christ. When another member is hurting, we must come to the aid of that member. All the Things – All things have been granted to us in Christ, and therefore must be used to serve our brothers and sisters. The Catechism says it well, “Everything the true Christian has is to be regarded as a good possessed in common with everyone else. All Christians should be ready and eager to come to the help of the needy . 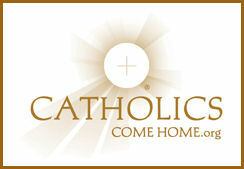 . . and of their neighbors in want.” A Christian is a steward of the Lord’s goods” (CCC 952). We do not only have spiritual goods in common (in Latin Sancta), but also we share a communion among us as persons (Sancti). The three states of the Church are united together because Christ is the head of His Church. From this point, we can understand better why the Church believes in the intercession of the Saints. We understand that since they are united with us, that they wish to assist us as much as they can to grow in virtue and holiness. We are united with them in Christ and therefore the effect of their prayer for us is greater than if we were not united in spirit with them. This also applies to us on earth who pray and make sacrifice for the Holy Souls in Purgatory. They are assisted by our prayers in many ways. It stands to reason that the Church in her wisdom follows the line in the Credo, “We believe in the Holy Catholic Church” with “The Communion of Saints”. We, the baptized faithful are a family, united in Jesus Christ. My grandfather always says, “when one hand hurts, the other hand comes and helps it”. Perhaps you have felt the pain of watching the body of Christ across the globe get slammed repeatedly. If you’ve ever spiritually winced over the Church’s struggle, please join with us in praying for the Church who is so badly hurting, because in the end, you’ll also be helping yourself.